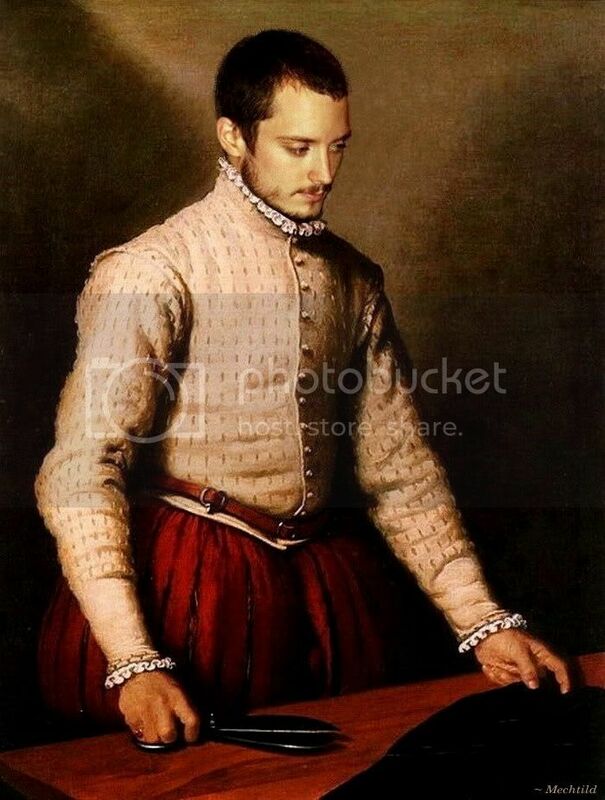 Elijah Wood as an Elizabethan man. ~ detail from Elijah Wood in "The Tailor", by Giovanni Moroni. I've been in a creative funk. I've read loads of stories read for the MEFA awards, but have been dragging my feet writing the "votes" (reviews count as the votes in the MEFA contest, a competition in which *length* matters). My own fic? More foot-dragging, while I think it over and procrastinate doing research, etc. But then came a moment of inspiration, this time in the form of Elijah Wood. Well, Elijah Wood's face, to be precise. You all know how enraptured I am by Elijah Wood's face as Frodo -- so beautiful, so classical -- the inspiration for myriad "Frodo Art Travesties". But Elijah Wood's face as Elijah Wood has never produced that response in me. Perhaps it's his hair, which always looks so contemporary. I'm an art history fan, a costume history fan. Not a fan of holey jeans and t-shirts, kitty hair, faux-hawk, or shaved-head fan. Because I knew people who were attending it, I followed leads to photos from this event. And, lo, I saw the photos of melyanna_65. I was smitten. The pictures! Elijah's look in the pictures! "An Elizabethan gentleman!!!" I gasped, lost in admiration for the way his newly-grown out inch of hair made a thick, short, shining dark mat that showed off the shape of his fine skull; his beard was a chin-and-jaw-delineating marvel. I had just been cruising a website filled with Tudor and Elizabethan portraiture, and I knew I had seen a perfect painting for him. I Googled, I searched, and there it was: a painting of an unknown man, apparently a tailor, by an Italian artist from the end of the 16th century. "Perfect," I thought. A new manip was about to be born. But first I approached melyanna_65, to ask her permission to use her photograph for the project. Not everyone is keen to see EW's photo used in this way. I sent her a copy of the painting I would be using, and the photo I thought would suit it. I wish to present my first (and last? -- who knows how long he'll continue to wear his hair and beard this way) Elijah Wood Art Travesty. I will include it in my "Frodo Art Travesty" album, since it is the only one. Portrait of an unknown man, known as, The Tailor, by Giovanni Moroni, c. 1570. It's a shame the tailor's hands are so un-Elijah-like. Handling scissors and pins and draping fabric must have been more wearing on the hands than I would have imagined. The tailor's face is young and comely, but his hands are noticeably aged and roughened, and very much reddened, compared to his face. Still, I love the painting. Cropped version of melyanna_65's photograph of Elijah Wood at Comic Con. HERE is Melyanna's excellent LJ entry about the Comic Con (where she got to meet EW!) featuring this photo. Little was necessary beyond tweaking the lighting, colour, and focus in both the source painting and face, so that they matched. I had to draw in some wisps of hair, very tiny, to blend the hair into the background, make shadows on his face, and draw in a bit of extra collar. I also adjusted areas of colour in the original, just here and there. But not that much needed to be done. The head really was a good match for this particular painting. 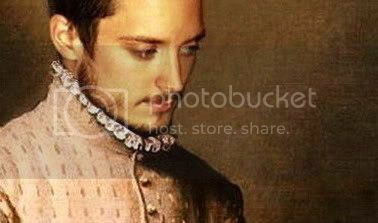 ~ Elijah Wood as a young Elizabethan man, in Giovanni Moroni's portrait of an unknown man, aka "The Tailor", c. 1570. 4. A bit of text. I never am content only to present a manip; I like to have words to go with it. No, the painting is a bit too early for that, 1570, which is only six years after Shakespeare was born. His first play wouldn't be produced until 1590 (Henry VI, Pt. I). But I am willing to fudge a little. I thought further, what if Shakespeare noticed this young man? So beautiful, so quiet, yet with such speaking eyes as he toiled over the heavy velvets and ran prematurely roughened hands over fine linen. As many of you know, Shakespeare was purported to have fallen in love not only with women but with men. (He did not only pant for Gwyneth Paltrow.) His first sonnets, #'s 1 -126, are often thought to be directed towards a young man whom he loved when he was in his middle years; maybe not consummated, maybe secretly, and from afar. But anyone reading this can understand the power loveliness has to attract, especially when one is *getting on*. Therefore, I thought the sonnet went wonderfully well with this "Elijah Art Travesty". 'You were created by Nature as a woman but more beautiful than any woman, for you do not have their faults. But Nature changed her mind as she made you, and turned you into a man, for she herself adored you, and, perhaps desiring congress, gave you male parts. Therefore I cannot love you with the fulness that I would love a woman. But let me have your real love, while women enjoy the physical manifestation of it, which I know to be merely a superficies'. Other LJ entries presenting "Frodo Art Travesties" may be found here. That's amazing, and absolutely seamless. Thank you, Mews. Isn't it a perfect sonnet? I knew the sonnet existed from reading a great book I had read about Walt Whitman this spring, after seeing "Brokeback Mountain." But I could NOT remember what number it was. It took a lot of scouting around. Mmmmm, that's a vast improvement on the original! And what a lovely sonnet, I can't recall reading that before. Onya Shakespeare! A "vast" improvement? I thought the original man was quite nice-looking, with a very intelligent eye. But it is true that Elijah is MASSIVELY handsomer. I just told Mews, I read the sonnet in a biography of Walt Whitman this spring (an American poet of the 19th century). I could not remember the number or even a quote, but eventually found it under "love sonnets - to a youth". Yeah! Hey, there, The Art of Fic! It's good to see you. I am glad that you liked the manip and sonnet. I really thought they went together well. And your quotes are priceless. See what she did from my pic? Isn't that manip a marvel? I love the final version of your manip. That's great! And Elijah's face fits perfectly in it, maybe it's his expression, so regal and elegant. I'm glad that my pic inspired you another wonderful manip! So well done. Melyanna! I am so glad you like what I did with your wonderful photograph. That shot really was the "pick of the litter" of all the Comic Con photos, as Americans say about puppies. I was just lucky I had just been looking in that site full of portraits. That sonnet does make me think of lovely Elijah! It really is a very fitting poetic expression of how many of us admirers feel about him, I'd say. I didn't expect it to suit so well, only remembering that it was a poem that declared the author's love for a youth. Thank you, Random fandom. Who made your icon? He's looking very Ancient World there, or else he is cross-dressing. ;) He looks darned lovely, though. You are a manip queen, Mech! I really love the cultural background that you provide to deepen your graphical work. … Elijah Wood has never produced that response in me. … Not a fan of holey jeans and t-shirts, kitty hair, faux-hawk, or shaved-head fan. I think Elijah’s face has a classical beauty and posses a peculiar characteristic: often it is so transparent that the feelings inside are clearly revealed. As Frodo, during his acting, that is always evident and very stunning. In his real life pics, most of the times, he stands in a pose (he is a professional), but in some pics, here and there, this transparency is so clear that is touching. The pic from melyanna that you chose is one of them, and you made an amazing job. Thank you, love! May I have more? Yes, his face is transparent when it is unguarded, or when personal feeling overrides the fact of being in public (I'm thinking of him at the Oscars, for instance, when no amount of being on camera could disguise his joy, pleasure, awe and emotion at being part of such a creative "family" as that cast and crew). Or in the recent pics of him seeing off his lover, Pamela Racine, at the Los Angeles airport. Those are certainly my favourite of his real life pictures ever. What a mix of emotion (mostly happy) his face is in that series of photos! The pictures by melyanna are superb. Not only is he looking great by my picky "must be classical painting" standards, they are mostly candid, so his real expressions show more. What a wonderful idea and what a beautifully done manip! Mechtild, that is gorgeous. In combination with Shakespeare's sonnet it starts to glow even more, in a sort of reflective way. I am not only enchanted by the picture's colouring (those delicate beige and roseWOOD shades! Those velvety browns and reds of table and trousers! *swoon*), and how perfectly Elijah's head fits in - it is as if I could see an important part of Elijah's soul. He embodied an English Gentleman (well, Gentlehobbit) for some years! That is only possible for someone who has is in it anyway. Yes, melyanna's reports were indeed excellent. I am sure there were others out there, but I only saw a few. Did you read pearlette's report in her LJ or in The Faculty? It had no actual pictures, but it was vivid enough; comic but affectionate. Yes, his face is very reflective in this. I think that is why I have done so many Art Travesties of Frodo in portrait paintings. The artists really knew what they were doing. Even if my addition of Frodo's face alters the original painting, the original paintings always have such strong moods, just from their style, colours and composition of the scene, they seem to add that sense of reflectiveness to the finished piece, a sense which wouldn't be there if it were just Frodo's face from the screencap set into something else entirely. That's fantastic Mechtild! I think it actually looks better than the original, it seems somehow odd that the man in the painting is looking at us, and the way Elijah's gazing off into the distance seems to fit the 'look' of that era better. Thank you to the lovely melyanna_65 for letting you use her photo, and thank you for sharing the beautiful art work you made with it! Thank you for commenting, Starlit. The subject in portraits often is shown looking directly at the viewer. Although the painting is called "The Tailor" for cataloguing purposes. Unfortunately, the identity of the subject is no longer known, so it loses some of its impact as an actual portait. But, as a painting of tailor, pausing a moment in his work, regarding the viewer with a look that could mean any number of things, the painting really speaks to me. With Elijah in it, and in that pose, it is completely changed. Yet it retains an almost contemplative quality. With him in it, it also looks as though he is pausing in his work, but not because a hypothetical visitor has stepped into his work area, but because the painter has observed him unawares in a reflective moment. It's very beautiful, the result, I think. I could look at it and look at it, even if it weren't EW in it. Thank you, I think so, too. You were there, Pearl (lucky dog). Was that face shot by the worthy melyanna faithful to the original? If so, I might have stood rooted to the spot and have to be shoved repeatedly ("Duh...hunh?") to make me move ahead in line. Or taken off by security as loony.